Participation Requirements: Requires audition. Please email ensembles director. 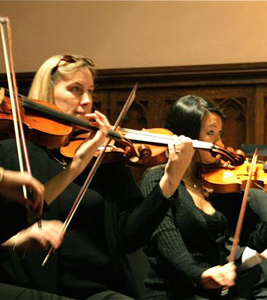 The Case Camerata Chamber Orchestra ( MUEN 386 ) is open to all CWRU students, faculty, and community members by audition who play string instruments and desire to perform in an flexible but very high quality string instrumental music setting. The group rehearses twice per week for a total of 90 minutes and performs 2 to 4 concerts per academic year. The repertoire performed in this ensemble is wide ranging and drawn from a variety of smaller chamber genres that include pieces from the baroque, classical, romantic and contemporary stylistic periods. Some of the pieces are conducted and others are rehearsed collaboratively by the group with coaching from the director. The group collectively decides the program and many pieces use soloists from within the group. Additionally, there are opportunities for this group to collaborate with other ensembles in the Music Department including the Case Chorale, the Case University Circle Symphony Orchestra, and others. When is the first rehearsal? Request course (MUEN-386) permission in the CWRU Student Information System (SIS). Course permission will be granted after an audition has been completed during the first week of school. Permission requests will remain pending until the end of audition week. Once you are “granted permission” you need to go back into SIS and complete your registration. What is the difference between registering for 0, .5, or 1 credits? CWRU will provide all percussion for those students enrolled in our ensembles. Specialty and large instruments are available on a limited basis for use by those enrolled in our ensembles. Lockers are available for music majors, minors, and those non-majors who participate in a Department ensemble. When does the Case Camerata Chamber Orchestra perform? The Case Camerata Chamber Orchestra 2018-2019 Performance Calendar will be distributed in the first rehearsal. All Auditions for the Case University Circle Orchestra ( MUEN 385, Monday and Wednesday 7:00 – 8:30 pm ) and Case Camerata Chamber Orchestra ( MUEN 386, Tuesday and Thursday 7:00 – 8:30 pm ) will be held in the Denison/Wade Rehearsal Facility beginning on Monday, August 27, and continue through Thursday August 30, 2018. Auditions begin each afternoon and go through the evening. Both orchestras require an audition for placement and seating. See below for more detailed information.